Hot on the heels of the Bruntscar path on Whernside, another project supported by the Mend Our Mountains: Make One Million has hit its fundraising target - and it's one of the most ambitious in the whole appeal. 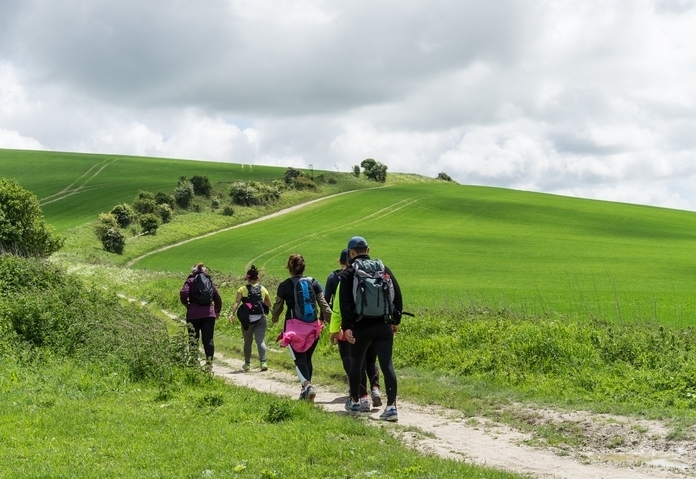 The whopping £120,000 raised by members of the public, businesses and charitable donors for the South Downs Way will enable vital improvements to be made to eroded sections of the 100 mile national trail across the rolling chalk hills of the South Downs. Work is already underway to mend the most heavily damaged parts of the trail, with a section at Plumpton transformed from a muddy, waterlogged quagmire into a brand new weather-resistant path. Work to fix other damaged sections at Millpond Bottom in West Sussex and Old Winchester Hill in Hampshire will take place later this year. The South Downs National Park Trust has coordinated local fundraising efforts under the banner of the 'Mend Our Way' appeal. This in turn has been part of the broader 'Mend Our Mountains: Make One Million’ appeal, which is coordinated by the BMC and has raised around £650,000 for projects across Britain so far. The South Downs Way is an ancient track thought to have been used by people for around 8,000 years. Today around 20,000 visitors every year walk, cycle or ride its length, and millions more explore sections of the trail every year. It crosses modest hills but it offers an enormous sense of space and escape amid the densely populated south east of England, and takes in the iconic chalk sea cliffs of the Seven Sisters and Beachy Head. More projects supported by Mend Our Mountains are expected to hit their targets very soon, with work starting on a rolling basis through the spring and summer. Watch this space for more updates. After the Bruntscar path on Whernside hit its £45,000 target last month, practical work started days later, with 130 tonnes of stone being airlifted to the site of the project and contractors getting stuck in to the work of repitching the path. “We want to say a huge thank you to each and every person who donated,” said Andy Gattiker, trail officer for the South Downs Way. Andy added: “Every single penny donated will go towards mending sections of the trail that had suffered the effects of erosion and mud over several decades. “Fifteen thousand pairs of boots, 10,000 tyres and 800 hooves travelling the length of the trail each year certainly cause a lot of wear and tear! “Our existing funding had allowed us to make most repairs but there were more remote sections of the path that were simply too expensive to tackle using existing funds. Carey Davies, Mend our Mountains Campaign Lead, said: “We’re thrilled that the appeal for the South Downs Way has its target. “This has been a great example of what can be achieved by working in partnership and coming together as a community. “We all have a role to play in looking after these trails and it’s wonderful that this project will ensure the South Downs Way is safeguarded for everyone to enjoy for many years to come. You help make more path repair projects across the UK happen by donating through the Mend Our Mountains: Make One Million appeal website to other MOM-supported projects such as Scafell Pike, Cader Idris and Dartmoor’s Nun’s Cross Path.